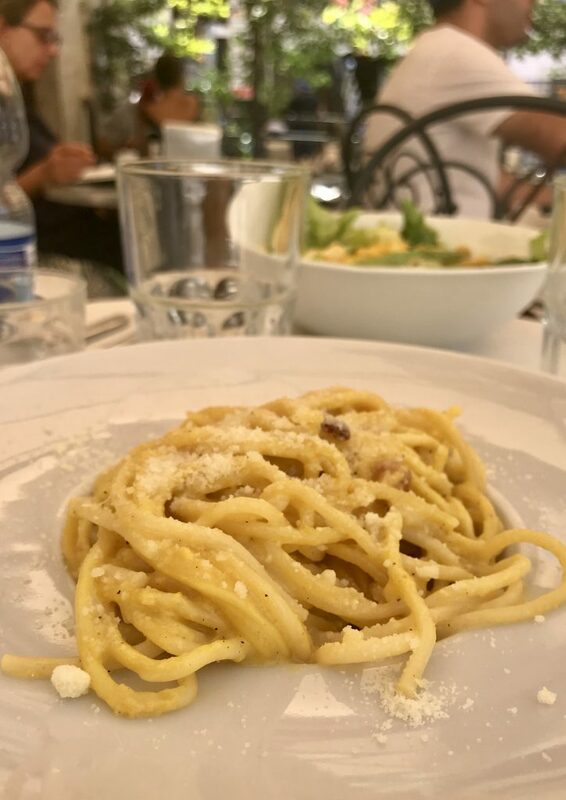 This past August, my family was lucky enough to travel to Rome and Sicily, a dream vacation that checked all the boxes: Culture, coastlines, family roots, and carbs. So very many carbs! 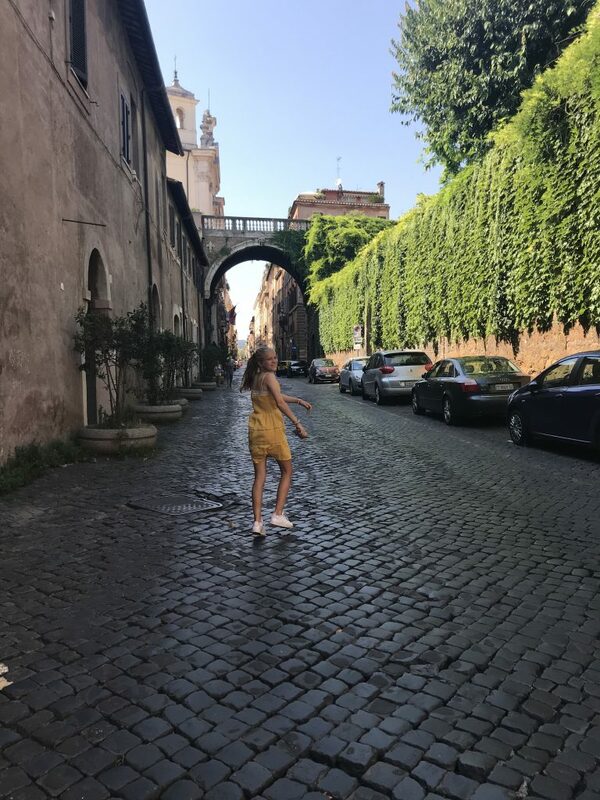 Today’s highlight reel is an attempt to capture Part 1 of the trip, three-and-a-half days in Rome. Part 2 was Sicily. 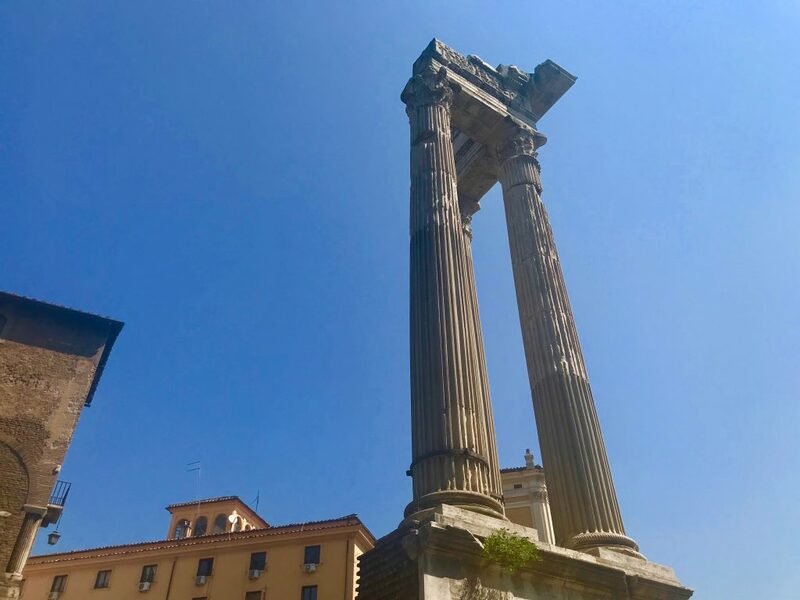 If you are going to Rome, there is something you need to know right off the bat: Everyone who has been there or lived there will send you The List. The first list I received was almost four years ago, after I told my friend Nell, who was living in Rome with her family, that we were planning a visit. A few minutes later, a four-page single-spaced word doc arrived in my inbox. 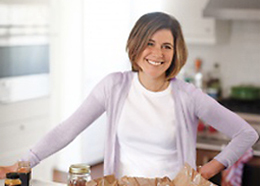 It was a working file that her husband Jesse had been compiling, and it broke down his favorite eating spots by category (pizza, pasta, gelato, lunch spot, dinner spot, traditional trattoria, date night, etc.) 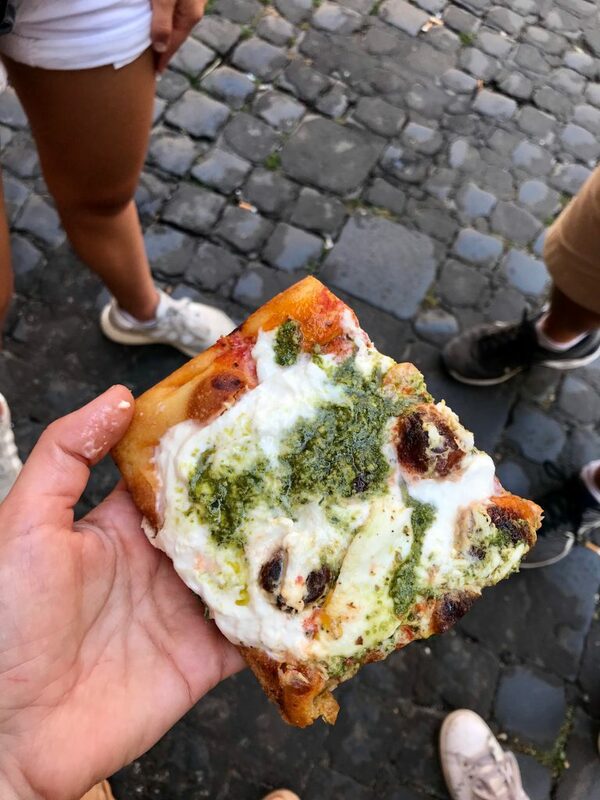 I saved that list for four years, and it was the first I referred to when I began strategizing our Rome eating itinerary. I cross-referenced it with Rome-guru (and DALS contrib) Katie Parla’s Open-in-August List and Elizabeth Minchilli’s Eat Italy App, and before we took off from JFK, I had a customized google map color-coded by source and food type. I felt ready. Rome Highlight #1: ALL THE LISTS! 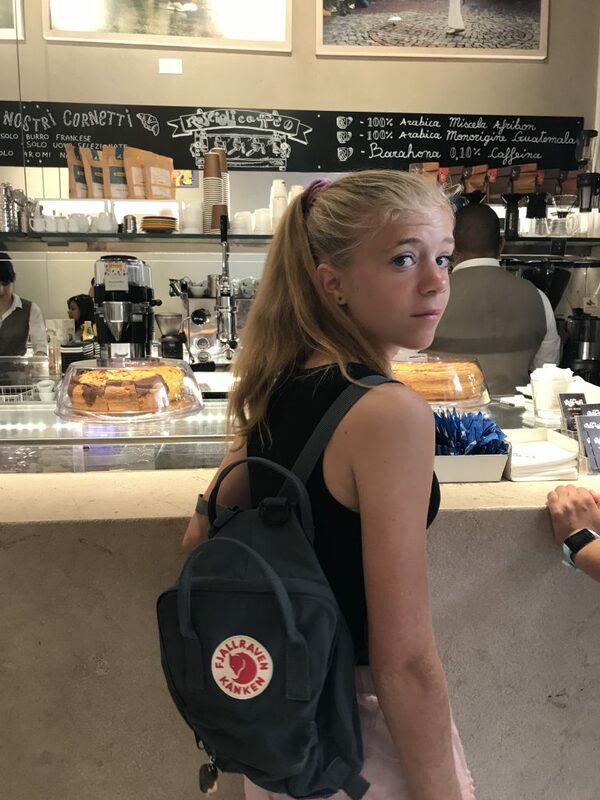 Good for: Breakfast, mid-morning snack, lunch, mid-afternoon snack, when you’re near the Pantheon or Piazza Navona or wandering Rome’s Historic District. On the other hand, if a restaurant is on every single list, it’s probably a good idea to check it out. That was the case with the pizza at Forno, made in a historic bakery in one of the more touristy corners of the Campo de’Fiori piazza. It’s sold by the slice, which is good, because you’ll want to try as many different varieties as you can. The crust is flat and crispy and topped wall-to-wall with thinly shaved potatoes, or mushrooms, shredded zucchini (Phoebe’s favorite) or just a thin layer of fresh tomato sauce (pizza rosso, Abby’s favorite). 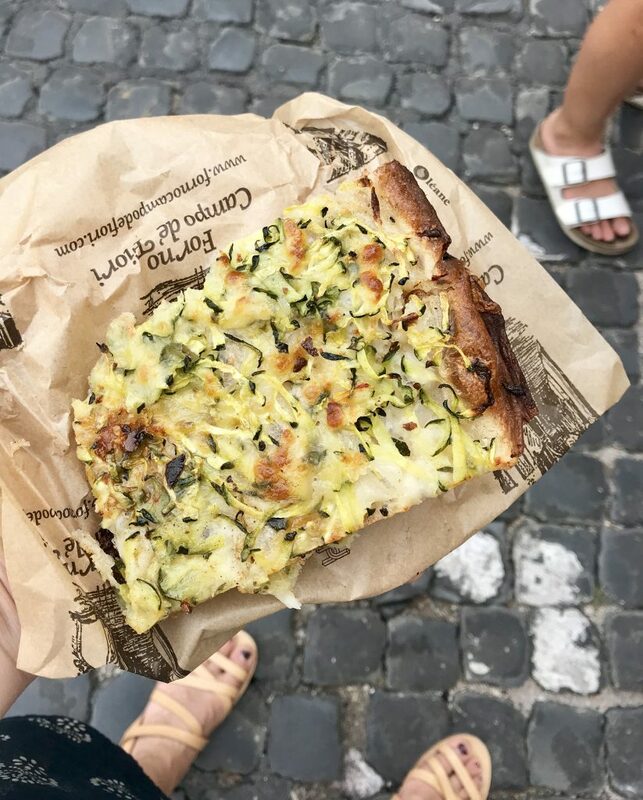 They have counter service, too, so you can order your slice — it gets crowded, but not terrible — then walk around the market at Campo de’ Fiori or sit on a bench and partake in the joy. It was close to our apartment, so went here all three days, sometimes more than once. There’s almost no wrong time to grab a slice. 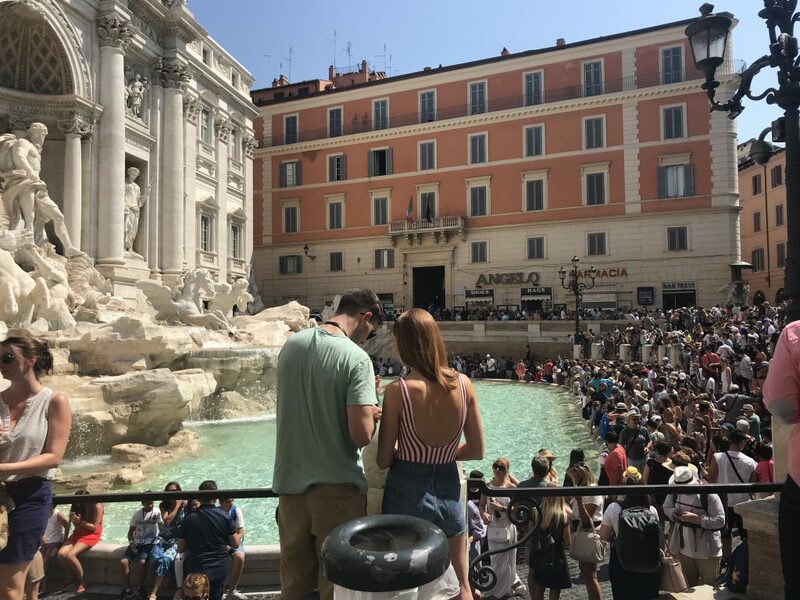 …and the next morning we hit the more new-school Le Tartarughe , which sold sandwiches, pastries and coffee and offered window views of the Fontane Delle Tartarughe (Turtle Fountain). If I lived in Rome, this would be where I’d go to meet a friend for coffee or read the morning paper. For dinner, we went to Giggetto, sat outside, and ate their famous fried artichokes while gazing at the Portico D’Ottavia. Three months later, Abby still brings up the bolognese she ordered there. Good for: Breaking free from the August crowd and heat OR for a lovely walk. Hey guess what? Rome is HOT and CROWDED in August. Heard that somewhere before? I did, maybe a hundred times before we took off. Everyone kept telling us not to go — We’d be sorry! We’d be so hot and miserable! Nothing was open! — but every time we listened to our friends on this point, we ended up giving up on Rome entirely. (It’s a long story, but if we are taking a big trip in the summer there are only a few weeks it’s possible to do so.) We finally bit the bullet, did our best to track down an airbnb with air conditioning, and committed to drinking lots of water. We vacation in South Carolina in August, I said to Andy. How bad could it be? OMG was it hot and crowded! (Why didn’t you tell me?) This is what Trevi Fountain looked like at about 11:00 in the morning on the day we arrived. And no amount of gelato would cool me down — trust me when I say I tried. 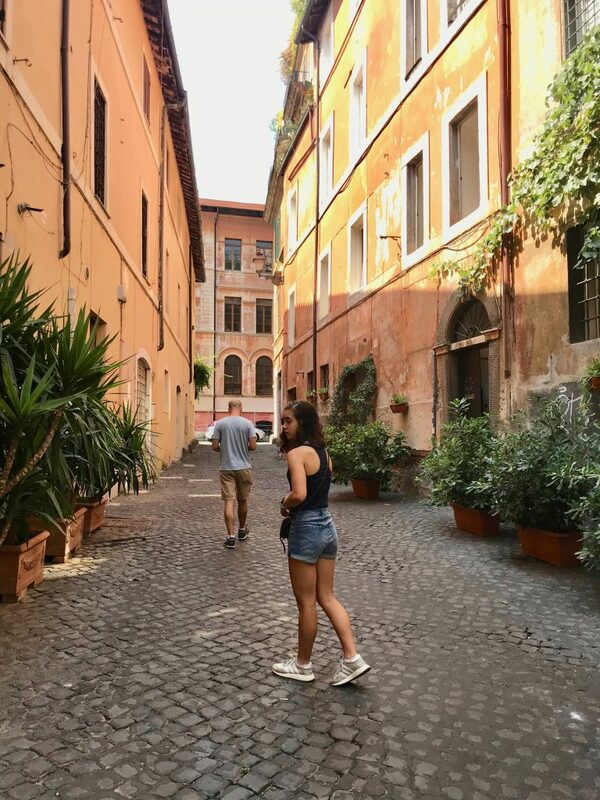 Lucky for me I had those LISTS, and the one from Nell recommended taking a walk down her favorite street in Rome, Via Giulia (shown before Trevi photo). It’s about a half mile long, cobblestoned, and packed with centuries-old churches, stately homes, and, an ivy-dripping entrance arch that was designed by Michelangelo. (Michelangelo!) My favorite part by far, though, was the shade and the silence. It was such a nice break from the heat. You know what else was a nice break from the heat? We were in Rome for only three full days and managed to hit five or six different gelato spots. (Do the math: That works out to 1.75 gelatos/day.) 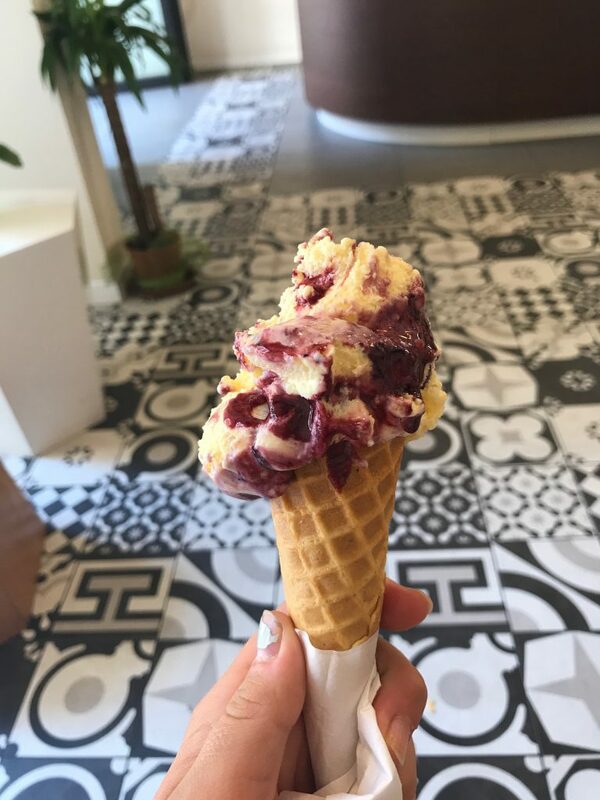 If we’re going to be technical about my favorite cone, I think Abby’s blueberry cheesecake shown above from Fatamorgana (multiple locations) is the hands-down winner. But if we’re going by a different metric, i.e. 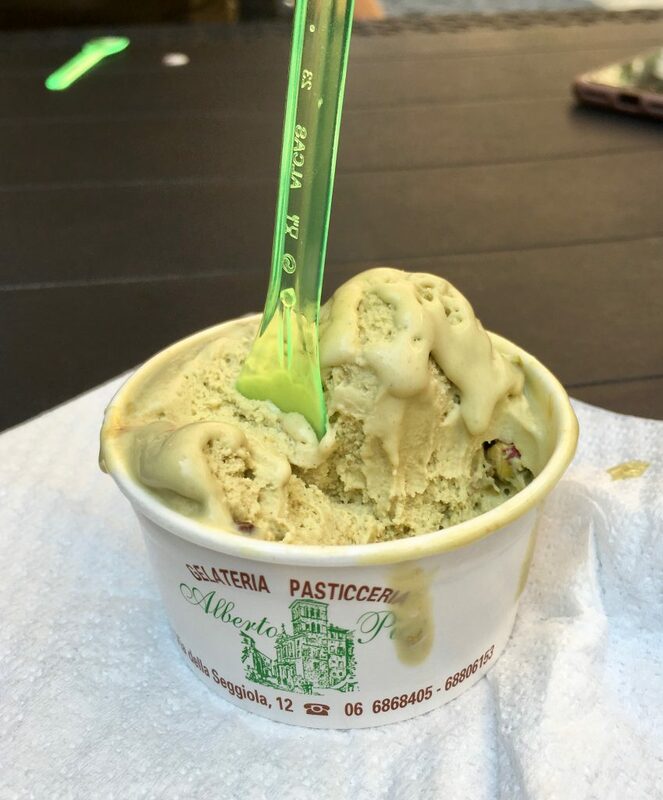 the feel-like-a-local metric , I’d go with Alberto Pica (specifically Phoebe’s pistachio) mostly because it was a block or two from where we were staying and it was never crowded with tourists, its ancient facade was shrouded in flowers and greenery, and just felt so neighborhoody. We loved sitting outside in the afternoon after walking eight hundred miles and devouring our well-earned cups. You can only imagine how many Aperol Spritzes we drank. (And if you followed my trip on instagram, you don’t have to imagine.) For the uninitiated, the drink is made from prosecco and aperol, served with an orange wedge, and it came as no surprise to me that I fell in love with the cocktail all over again in the country that invented them — especially since it was one of the few drinks that reliably came with a generous amount of ice cubes. (I will never understand this about you, Europe.) What did surprise me was how much I loved the little bowl of salty chips that often came alongside the drink, whether we were at Bar Toto in the Ghetto, a beach bar in Taormina, or a cafe in Palermo. Once I was back home, that combo was my go-to starter move for the rest of the summer, and I plan to revive it as soon as the weather gets warm again. Highlight #11, 12, 13: All the Rosciolis! …Naturally, we made the most of that hour even though we had just finished a slice from Forno: our order was pesto and burrata. I loved my friend Ted’s reaction when I told him I was going to Rome in August. Instead of the customary you’ll-be-sorry routine, he said “That’s great! 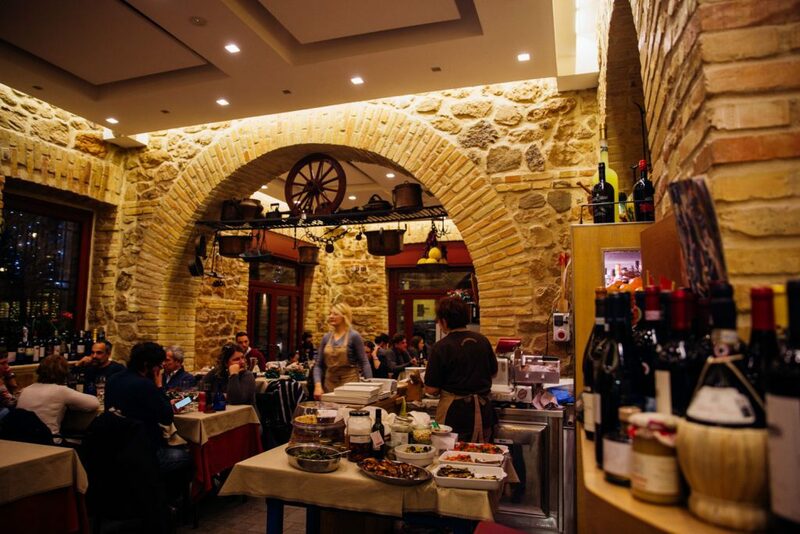 You’ll actually be able to get a reservation at Tavernaccia!” He was right. This place is on everyone’s list, but we had no problem snagging the reservation from New York a few days before our vacation. (Pro tip: Always secure a dinner plan for Night 1 of vacation in advance. It makes the transition so much smoother.) 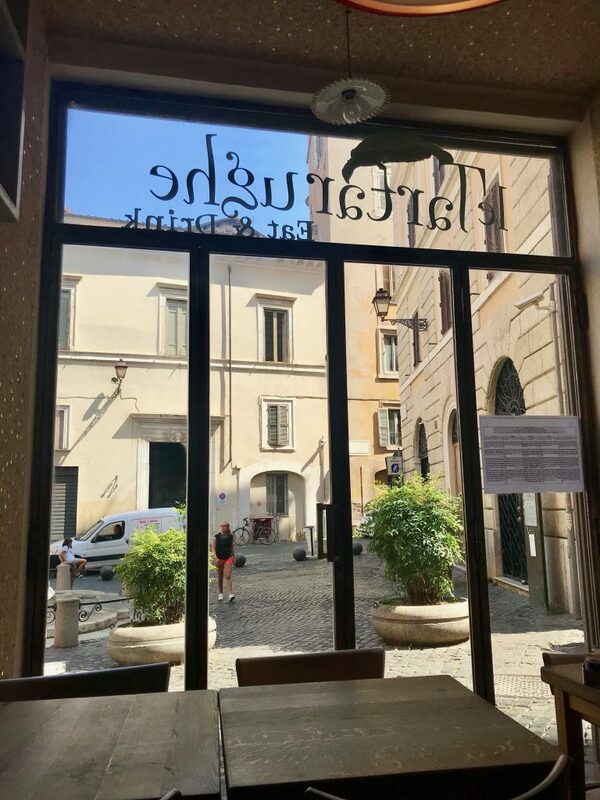 I didn’t take the photo above (thank you @plateselector) but that’s a good snap of the vibe — and just the vibe I wanted for my first night (ok fine, for every night) in Rome: Traditional. Half the patrons were Americans, though, so just know that going in. It did not take away from the night: We dined on their famous Roman classics: bruschetta, lasagna, Amatraciana and toasted our first real meal in Italy. I’m almost afraid to ask: What did I miss? As always, feel free to comment. Other Vacation Highlight Reels: Amsterdam, Hawaii, Miami, Virginia, Alaska. 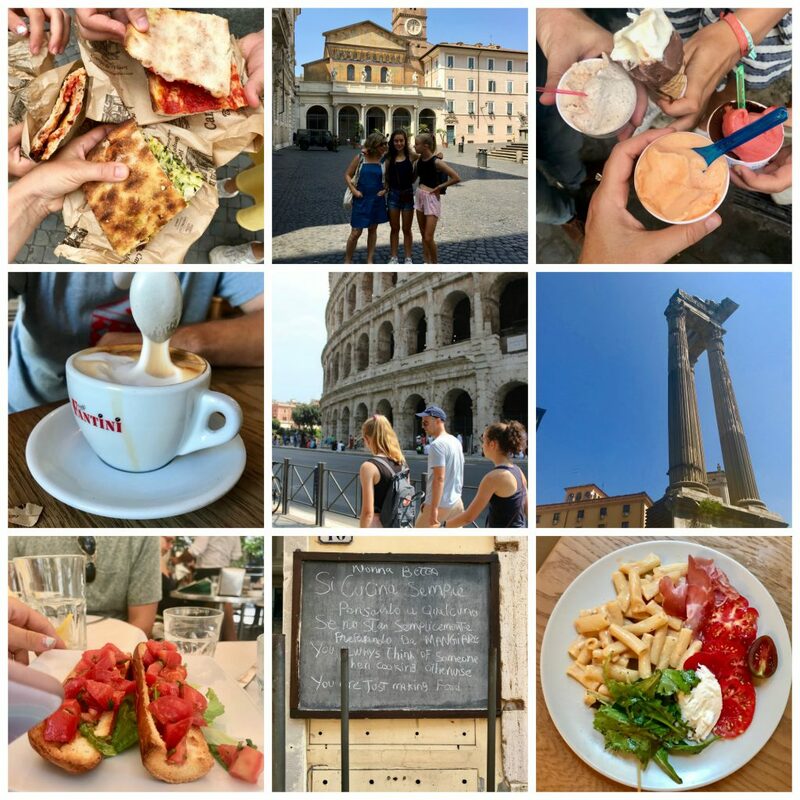 We did 3 days in Rome (followed by Siena and Sorrento) last year (in August!)! It all looks so familiar! We didn’t find it that hot, or that crowded, but we live in washington, d.c. (and i’m originally from charleston), so it just felt like home. We definitely took advantage of the public drinking fountains all over the city. 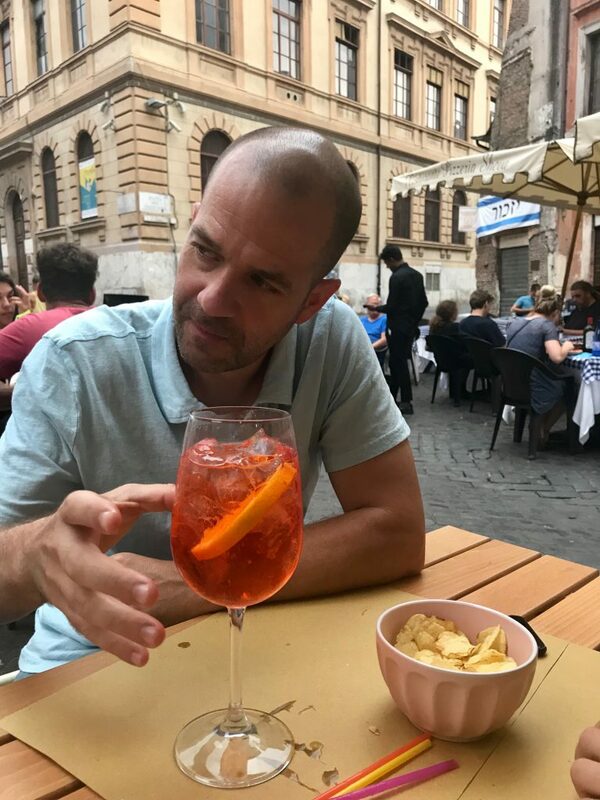 I think the fountain in the Monti neighborhood was our favorite place to just hang out with an aperol spritz and a dish of taralli (i so regret only bringing home one bag of those). We never had a bad meal, but our best meals were when we followed my basic rule: no pictures on menus and try to find an old man or woman eating alone. He or She is likely a local with good taste! I can’t wait to go back! I love that rule @awads! I’m a long-time reader and have three of your books, but this is my first comment! 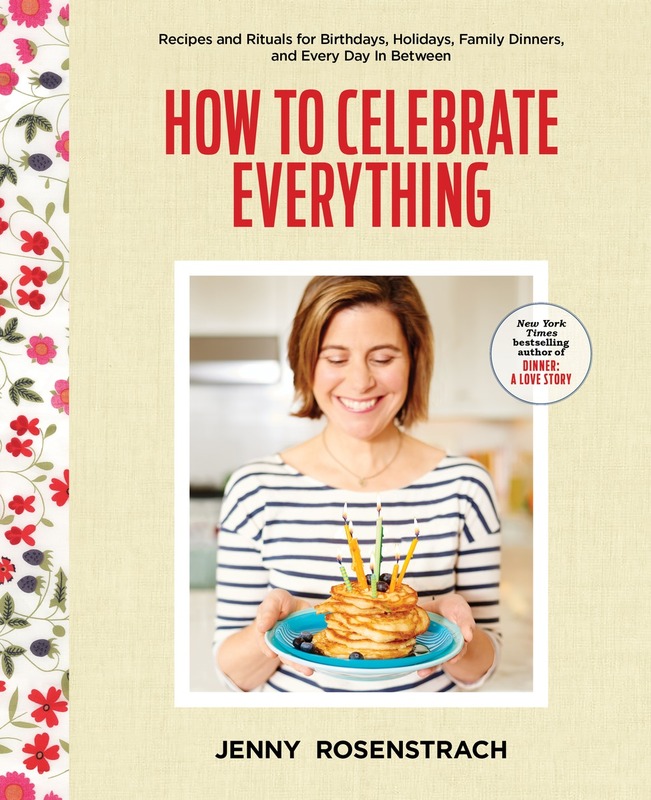 We went to Rome two years ago in August, and I relied heavily on Katie Parla’s blog. And although we don’t know each other, we must know Jesse (and Nell) in common, as I was the recipient of his enthusiastic email lists for both Rome and Florence. Our favorites for dinner were Roscioli (a reason to return!) and Tavernaccia da Bruno, plus we had a delicious lunch from Mordi & Vai. End of August was very hot, but we were lucky to be there when Pasticceria Boccione reopened, so we were able to try the pizza ebraica. I studied abroad in Rome about 10 years ago (before anyone utilized the internet so heavily for recommendations). I actually lived in an apartment in Campo de Fiori and so this made me so happy to know and recognize the area in all of your pictures! I actually don’t remember where I ate all of the time except for Giolitti for gelato and Taverna Lucifero (which was like an Italian fondue joint). My roommates and I went there one night for the best dinner of my life; we just asked the chef to serve us whatever he recommended (the menu was small) and he brought out this beautiful plate of pasta and I don’t even remember what it all entailed but it was mindblowingly delicious and the evening just felt so special. Anyways, your trip looked wonderful, I can’t wait to use some of these recommendations for my return trip…whenever that happens! I have been to Rome many times and simply love it. Your love story proves there is always more to taste there. Thanks for sharing. Oh Jenny! This post makes me so happy. My husband and I took a big European trip in 2010 together. Since then we have had three sweet little ones, so this type of travel feels like a lifetime ago. Thanks for letting us live vicariously through you! The hubs and I found Rick Steves’ Italy book to be indispensable and loved so many of his recommendations. My absolute favorite meal was a ristorante that we stumbled upon that had an opening and sat us outside. While I did journal every bite of food I ate (ha! ), I don’t recall all the details of that evening except having a fried squash blossom that was incredible. I think that one meal and bottle of wine lasted for two and a half hours. Just such a perfect and sweet memory. Unfortunately, my friend and I DID in fact go very wrong on my first trip to Rome. We ended up in a restaurant near our hotel (near the station) in which we were the only patrons. Our lasagna was quite clearly microwaved. I would add a rule to one of the comments above (the one about no pictures on menus): no dining at restaurants with dudes outside trying to lure you in. Live and learn! Love all of your travel lists! We did Paris this August with our kids (which was also crazy crowded) and used your recommendations! Thanks for all the great information! I just got back from one week in Rome and Naples with my partner and I am delighted to see so many of our favourites on your list, too! 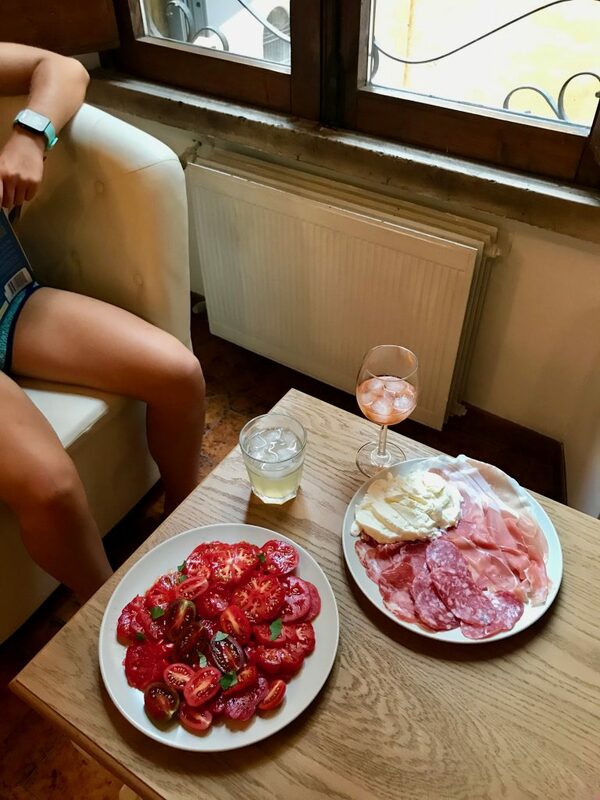 We absolutely fell in love with the Rosciolis, too, and we spent over four hours having a decadent Sunday lunch at La Tavernaccia – simply divine! 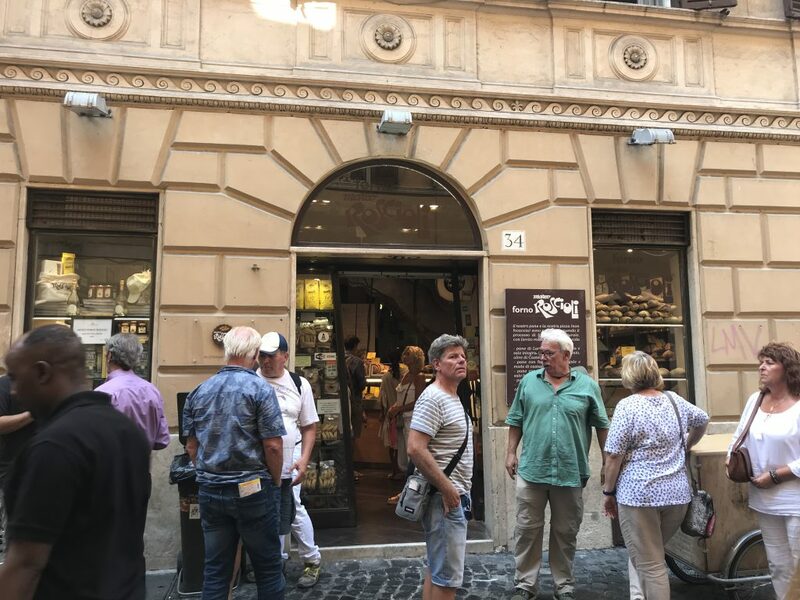 Some of our other food favourites included gelato from Grachi (a few locations throughout the city) and dinner at Armando al Pantheon (a mixture of tourists and locals, seriously good Roman pastas and meats/offal and a great wine list). Our other great discovery was taking a cooking class! We made our own ravioli and meatballs which were actually delicious and our lovely host made it seem simple enough that we could replicate at home (I’ll keep you posted on results haha). Hi Jenny! This list is amazing! My family and I are traveling to Italy this summer and just starting with lists ~ this is so helpful! We are starting in Rome and then to Florence… may I ask where you stayed in Rome? Hotel? Apt? 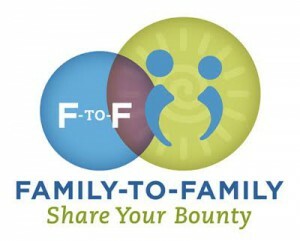 There will be 5 of us. Thank you so much! !